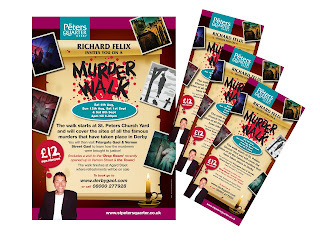 PE Creative: its murder in Derby…! Richard Felix is famous for his Ghost Walks in and around Derby…we were pleased to be asked to produce some flyers and posters for his latest MURDER walks, taking place right here in The St Peters Quarter. We used some ghoulish typography and some sinister retouching to create these bloody pieces. Both the posters and flyers were printed digitally which meant that the maximum impact could be achieved at the lowest possible price. To find out just how little these cost to make such a BIG impact call us on 01332 291141.